In this week’s passage, Beowulf and Grendel shake Heorot to its very foundations. There’s a lot to write about this week. So I’ll see what I can do. After a few weeks in which passages were fairly dry and straightforward, save for a word or phrase on which I could hang my fan theory hat, this week’s is rich and juicy. First up there’s the word “renweardas” (on line 777). This compound word isn’t out of place being written of in this section, since its nature as a compound is fairly unremarkable. It’s not the word itself I’m interested in so much as how it’s been conjugated. In context, “renweardas” is the “hall wardens” of its line in this passage, it’s the word that refers to the hall wardens currently fighting in Heorot. But why is it plural? This is puzzling because you’d think that the poet would refer to just one hall guard: Beowulf. (Unless he heard a different version of events, but I’ll get into that in a bit.) With this plural noun there are two possibilities for interpretation. The first is the wildest: the poet is referring to both Beowulf and Grendel with this noun. At first glance this might sound crazy, but I think it’s possible that Grendel is being regarded as a hall warden in that whenever he’s in the hall no one else can get in. And what’s the definition of a great warden or guard? One who keeps the unwanted out. And Grendel does that wonderfully in Heorot, though his definition of “unwanted” is not the same as the Danes’. Whenever Grendel’s been on duty at any point in the last 12 years, no one has been able to get into Heorot. He’s been keeping people out, but he’s been keeping people out of a place designed for joy and companionship and socializing. He’s keeping a tight guard on a place that really requires a narrower filter on the in-flow of people. And those people need to be in it in order for its function to be fulfilled. With this in mind, I think the poet could be having a bit of a joke here. Or he might just be upping the ante and showing the binary forces that are here — a guard who is too perfectly and senselessly a guard (like a poorly programmed machine guard might be, actually) and a guard who is human and able to properly discern between friend and foe. If this is the case, then this isn’t just a fight between Beowulf and Grendel, it’s a fight between the old guard and the new — literally. The other explanation of why “renweardas” is plural is because the poet is referring to all of the Geats. From his description of the tumult and madness within Heorot it definitely seems like people outside would guess that it was the noise of many in combat. Of course, its being only two introduces some nice dramatic irony in that the audience will clearly know that it’s just two combatants having one hell of a brawl. And that brings me to another of the points raised in this passage. On line 776, the poet uses the classic filler phrase: “so I have heard” (“mine gefraege”). It’s possible that this is just a throw away phrase used to round things out and to give the poet a chance for a breath in the midst of a very intense scene. But it’s in a strange place if you look at it logically. How does the poet mean “so I have heard”? Is this second hand information? Was he there? Did he hear it from one of the Danes? Maybe one of the Geats? In the middle of a scene that’s defined primarily by the intensity of its noise (enough to wake drunken Danes from their sleep), it’s kind of comical to be told that the teller you’re listening to has heard about what sorts of sounds were coming from this fight. What do you think the phrase “so I have heard” is doing in this passage? Is it just filler, or is there something more to it? This week’s passage is rich in compound words, though they continue to be fairly straightforward. Nonetheless, the combination of words in each of these compounds does seem to suggest something that’s a little different from their modern English definitions, a shade of meaning that has since fallen away or been so well integrated into their new sense that it’s been forgotten. But I think it’s instructive to drill down into this word’s meaning a bit. After all, if a citizen is necessarily a dweller in a town or castle but not a village why make the distinction? I think part of the reason why is because a village or even smaller community of scattered people doesn’t have a strong central authority or clearly marked border. Speaking from my embarrassingly limited knowledge of medieval social structures at the level of government, such small organizations of people as villages or even just farms scattered across pasture land would have been related to a single lord or (later) a parish. These institutions would act as central authorities, sure, but they’d still be ruling over a people that were few or that were scattered. Because of this, and because of these communities’ exclusion from “citizenship” in a sense, I think that to the Anglo-Saxon mind the word meant belonging to a strong amalgam of people who lived more closely together than disparate farmers or were longer than a village that even in the middle ages you might miss if you blinked while riding through on horse or in cart. So “citizenship” isn’t just something you can apply to anywhere, it refers particularly to a strong centrally governed, populated place. There’s a certain civilized feel to the word, as if it could be placed on the opposite side of the spectrum from a word like “folk” and its implication of country people. The people the poet’s referring to here, then, aren’t a bunch of bumpkins but instead a bunch of civilized, worldly people. In short, if you like, people you can trust to give you the facts straight without much embellishment. The sort of people you might want to “have heard” something from, in fact. Next up is a word that I’m surprised didn’t transition more cleanly into Modern English. “Ealuscerwen” means what it may sound like: to be deprived of ale (in the sense that you are shorn of it (literally), that it is somewhat forcefully taken away from you). Clark Hall and Meritt define the word as “deprival of joy,” “distress,” or “mortal panic” and Wrenn cites many sources that suggest that the word is a metaphor for the distribution of bitter ale, suggesting that disaster follows grand celebration. But I disagree with both. I think that “ealuscerwen” isn’t so much a word that refers to the deprival of ale or beer, but the deprival of its effects. I think that when everyone is woken by Beowulf and Grendel’s brawl in the hall, they’re woken from a deep, drunken sleep and that is what they’re being deprived of: sweet sleep. And this is so disastrous because the sleep after drinking heavily at a party like the one thrown for Beowulf is one of the few peaceful experiences for the Danes. After all, if you were living in a place that was regularly attacked by a monster at night who brutally killed and devoured any people he came across for a solid 12 years would you sleep soundly? I think a little nightcap might be pretty appealing then, and that parties like those thrown for Beowulf would be so enjoyed not just for the joy and fun and happiness experienced while drinking and socializing but also because of the joy of a deep sleep that you would truly enjoy because of its deepness. It would be the sort of sleep in which you’d forget all of your waking life’s problems. Being deprived of that sleep, an effect of the ale or beer you drank, but not the beer or ale itself, would be like having your greatest happiness snatched from you while you were in the middle of enjoying it. Truly a cause for great distress. There’s definitely a sense of permanence about this word. It sounds like a house or castle that’s made of the very soil or made so solidly that it’s more a feature of the landscape rather than something on it. This word, I think, carries some hubris with it, though we don’t get any true foreshadowing of Heorot’s future until next week’s passage. This one combines the words “searo” and “þanc” to deepen the sense of sagacity and skilfulness of whatever it’s being applied to. How? By expressing the idea of a person who’s so skilful they could do something with their eyes closed but instead they’re doing that thing with their full attention — guaranteeing that whatever they’re doing it will be utterly masterful. What do you think of this week’s words? Should (or could) a word like “ale-deprival” make its way in Modern English? Next week the poet dwells on Grendel’s defeat. 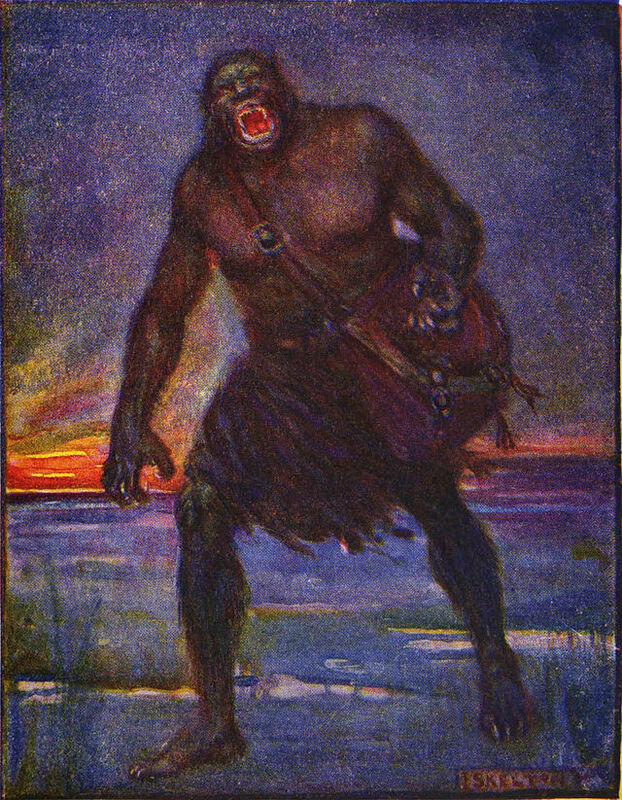 An illustration of Grendel by J.R. Skelton from Stories of Beowulf. Grendel is described as “Very terrible to look upon.” “Stories of beowulf grendel” by J. R. Skelton – Marshall, Henrietta Elizabeth (1908) Stories of Beowulf, T.C. & E.C. Jack. Licensed under Public Domain via Wikimedia Commons. Grendel comes slinking over to Heorot, but Beowulf wakes and waits. Well, although the first two lines and a bit are more suited to last week’s passage (they’re a reiteration of the idea of god’s power), they go well with this week’s too. Why? Well, because it reminds the audience that god is there and so such an ungodly thing as the Danes losing out on their hero entirely won’t happen. In a way, I wonder if this reference to god’s power is here at all less for reiteration and more to solidify the frightening aspects of Grendel. For an enemy that humanity can’t deal with on its own must be truly terrifying. And Danes and Geats and Anglo-Saxons alike surely didn’t think so little of themselves that they needed god for every thing. But I’m getting away from the passage. Aside from the opening sentence, the rest of this week’s passage is about Grendel’s approach and Beowulf’s being awake. Though just how is he awake? Last week, I got the sense that Beowulf bedded down with the rest of his thanes. So he had his bedroll down or whatever and had settled into rest before the narrator cut away to the machinations of god. But here we’re told that everyone in the hall (who was supposed to be guarding it, by the way) were asleep except for Beowulf. So was Beowulf cunning enough to realize that he could catch Grendel by surprise if he pretended to sleep as the others did? Or was he actually asleep for a time and then stirred before Grendel arrived thanks to some sort of divine intervention? Considering Beowulf’s fixation on the fight, I find myself leaning more towards his being woken up through god’s touch. So, in truth, all the Geats had fallen asleep, including Beowulf, and his happening to stir to wakefulness is the miracle that saved them all (well, as we’ll see in a few weeks, almost all). Thus, this is where the might of god (as the narrator describes it) is shown. Truth be told, I like the idea that Beowulf’s waking is an act of god because it seems somehow apt that the great boaster (still in his late teens, likely) is still susceptible to sleep. Such a reading is supported by the flow of the narration, as it moves from describing Beowulf’s pre-bed vow to the Geats settling into bed to god’s role in what’s to come to Grendel’s approach to Beowulf’s waking with a curse and a pledge of violence on his tongue. It’s like god woke Beowulf but he’s nonetheless grumpy when he first gets up, so Grendel’s not just his enemy, but likely the first thing he sees and turns his freshly woken rage to. Anyway, the other thing that I think is of note in this passage is Grendel’s characterization. This kind of gets into the second section’s territory since it has to do with words, but bear with me. Add to this his being sin-stained (“scynscaþa” (l.707)). The references to shadow alone paint a picture of Grendel as this being who lives more in darkness than in light. It makes him a very mysterious figure to modern readers, but keeping in mind the way that Anglo-Saxons categorized colours (that brighter is better, brightness is the defining quality of colour), Grendel must have been a terrifying force utterly opposed to all lightness, merry-making, and friendship. That sounds kind of bad to us, but to a society where those were essential for the physical survival of individuals, relationships and social networks, such a creature could be compared to a sentient computer virus. What really strikes me about the way Grendel’s described, though, is that those three words all have an “s” sound in them. Shadows can be very fleeting, they shift and move as their light does. And what could be more fleeting than the letter that you sound by simply exhaling through closed teeth? The sound brings to mind steam from a kettle, smoke from a fire, or the sound of water racing down a river. All of which are fleeting and ever-shifting. That sound also gives Grendel a very slinky sort of feel, that he’s a creature that skitters about. A word that even in Modern English has disgusting connotations. So why then, maybe you’re wondering, is he named “Grendel”? There’s not an “s” in sight in that name. I think that, though he’s very much a creature who flits and slinks as shadows do and who dwells in them (possibly controls them? ), he is called Grendel because that is his signature feature. He grinds things, destroying them, dragging them down to the insubstantiality of a shadow, reducing them to dust and powder. It’s possible that this process would extend beyond people’s personal bodies to their reputations, their names. After all, none of the warriors who came before Beowulf to challenge Grendel are named. And why should they be? What do you think Grendel looks like? Something like a troll? Or more of a misshapen person? Let’s start this section off with a little more about Grendel and how he’s portrayed here. On line 709 Grendel is referred to as “geþinges” (meaning “creature,” or, more generally, “thing”). I think that within the context of this passage, using a word that boils down to “thing” (even if it can mean “creature”) suggests that Grendel is a being of little sentience. He’s denied any sort of personality or any sort of reasoning faculty. Just as the Anglo-Saxons probably likely believed it to be madness to try to reason with a bear, it’s pretty clear that Grendel can’t be reasoned with. This goes far to promoting his image as a being who has no other purpose than to destroy and spread fear and terror. I also think it plays into the shadow imagery that he’s so strongly associated with here. For, going back to the Anglo-Saxon classification of colour being dependent on light/brightness, a shadow would be considered near the bottom in the kingdom of colours. Just as the phrase “deepest night” is used here to indicate the darkest, deepest part of the night (literally “wanre niht,” the “dullest night” (l.702)). So Grendel’s being associated with shadows and referred to as a thing really makes it clear that he’s a being of sheer evil and not to be pitied in the least, nor empathized with, nor really regarded at all as anything other than a monster. I think this portrayal is here to either help forward Beowulf as god’s champion (or simply as a great warrior), or because Grendel, at one point, was something more. It’s easy to say that Grendel represents old pagan practices that don’t work because they aren’t true (remember the bit about the Danes praying to their idols for help back on lines 175-180? completely ineffectual) and Beowulf is the bringer of the new light, of the word of god through Christ and all that. But I don’t think that’s quite right. I think that the writer or transcriber of the poem was well aware of what Grendel was and wanted to downplay it to an incredible degree. Why? Perhaps to put what he represented into a bad light. But really, does it matter what Grendel is? He’s so generic in his being a personification of the lowest sort of evil that he could be whatever bugbear a society who took up this poem wanted him to be. At the emergence of Christianity as an evangelical faith, Grendel could be old religions; today he could simply be terror itself. This is what makes poems like Beowulf so transcendent. Not that they’re so open to interpretation that they can mean anything but because they’re drawn in just the right strokes to give such poems layers of meaning — some of which aren’t apparent until someone reads them hundreds, even thousands of years after they’re written. What’s curious about this word is that it, like many other words, suggests a connection between concepts that we don’t often credit to medieval societies. It combines the idea of grudges and anger with that of horror and fear. In short, it’s a word that suggests that the Anglo-Saxons were aware of the idea that we hate what we fear. In this passage in particular this is intensified, since it’s used for Grendel in the bit about Beowulf’s waking in wrath against him. So much for being the big brave hero — it seems that part of Beowulf’s might may well be in his extreme fear. Though maybe this is more than intentional if Beowulf has any sort of explicit religious aspect to it. It could be that the poem’s suggesting that fear tempered by faith, channelled through it (as Beowulf’s seems to be channelled through his faith that god will determine the victor in his various fights) creates strength in a person. Though, in this case, that strength seems to come from an extreme, faith-fuelled hatred or bigotry. Well. Timeless poems aren’t without problems. What do you make of Beowulf’s wrathful anger? Is it righteous? Is it an example of misguided faith? Next week, Grendel arrives at the hall and revels in what he finds there. 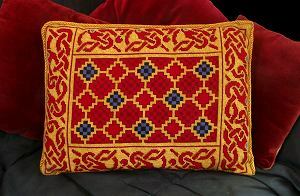 A pillow inspired by artifacts found at the Sutton Hoo site. Design by Karen Dixon, full information available at http://www.millennia-designs.com/tapestry-cross-stitch-embroidery-kits/76/91/53/. Beowulf and his fellow Geats bed down for the night while the narrator assures us that their beliefs about never again seeing home are unnecessary. ready seafarers gave themselves to hall-rest. Unlike last week’s passage, there’s a fair bit more going on in this week’s. Not that it’s wall to wall action or anything, but, nonetheless, I have some things to say about it rather than just a thing. In the middle of this week’s passage, we get something that seems uncharacteristic for the sorts of warriors Beowulf and his men are said to be. We’re told that “None of those thought that they should afterward/ever see their dear land again,” (“Nænig heora þohte þæt he þanon scolde/eft eardlufan æfre gesecean”(ll.691-692)). At first, this bit of information makes it seem as though the Geats feel that theirs is a doomed project. Countless others have tried before them and have failed. Why should they, a band of warriors whose leader is really an unproven whelp have any better luck? But, immediately after this fairly touching bit about never returning to where they were raised (ll.693) we’re given a little more information. The sort of information that clarifies things further and explains quite a bit about the difference between our culture and that expressed in Beowulf. From lines 694 to 695 we’re told that the Geats had earlier prayed (the word is “gefrignan,” meaning, in general “to ask”) that they should die in battle. Again, at first you think, well, that’s probably so that they don’t have to face defeat. That they’ll be remembered as having gone down fighting. But when you put this idea with the belief that they’ll never see home again, then you get what I think is the full picture. The Geats think that they’ll never see their homeland and loved ones again because hat’s just how resolved they are to dying in the fight with Grendel. It’s not that they’re afraid of the monster or sorrowful about a doomed fate. Instead, I think the poet/scribe is showing us the strength of the Geats’ resolve. They’re so willing to die in the service of this quest that they, in the calm before Grendel storms in, are convinced that they’ll never go back across the waters to see Geatland again. Nevertheless, this passage closes out with a curious reassurance. In line 698, the poet/scribe tells us that Grendel will be defeated, but by “one’s strength” (“anes cræft” (l.699)). What’s curious about this to me is that, on one hand, this seems to be about Beowulf. But If such is the case what’s unclear is whether this means that Beowulf’s strength overcomes Grendel’s or if it’s Beowulf’s strength that convinces god to give the victory to the Danes (as mentioned on lines 698-699). But, “one’s strength” (l.699) could also refer to god itself. Since Beowulf is always invoking god as the one who grants him victory after victory, it wouldn’t surprise me if the poet/scribe (more so the scribe) snuck this into the poem as a reference to what the Christian version of a single omniscient and omnipotent deity was. Based on nothing aside from his depth of knowledge, I agree with Robert Graves in his argument that the peoples of Northern Europe had the idea of a singular ruling deity, a sort of monotheism, before Christianity (as Graves outlines in The White Goddess). But it’s possible that early Christian missionaries sold those people on the idea of Christ and God and such on its being a new, fresh deity, someone who could overcome and vanquish the old gods or their champions. With this sort of reading, “one’s strength” takes on a much more proselytizing tone, and, over all, makes the poem weirdly more Christian than it would be otherwise (that is Beowulf thanks god for victories, but those victories are by god’s grace, so the whole poem, whatever else it is, is really about god’s grace in battle). However, where such a religious reading of this line falls apart is that there’s no clear reference to god. It’s possible that Beowulf, at best an adaptation of a hero from an earlier story, is god as god’s champion, and so that “one alone” is both god and Beowulf simultaneously. But to expect that this meaning would get across to the audience of a poem seems far-fetched to me. How much Christian influence do you think is in Beowulf? Are all of his references to god just references to a pre-Christian deity? This week’s passage isn’t without its compound words, but most of them are straightforward and to the point. They’re combinations of words that make sense together and don’t offer as much room for wiggling. These are words like “hleorbolster” (“hleor” (meaning “cheek,” “face,” or “countenance”) + “bolster” (meaning “cushion”)) or “wigsped” (“wig” (meaning “war,” “strife,” “battle”) + “sped” (meaning “success”). But, as in all good poetry, this passage does have its variety. This word is, at first blush, a simple compound. It combines the word “eard” (meaning “native place,” “country,” “region,” “dwelling-place,” “estate,” “cultivated ground,” “earth,” “land,” “condition,” or “fate”) with the word “lufan” (meaning “dear,” or “beloved”). So, very simply, we get the dictionary-prescribed “dear home” (as in Clark Hall and Meritt) or “beloved home” (as in C.L. Wrenn’s glossary). The difference here is infinitesimal, and it looks like an easy enough compound word to deal with. For the most part, “eard” is a word that represents earth and home. I think the inclusion of “condition” and “fate” in this list suggests that a dear home isn’t just a place where a person grew up, but also where they hope to die. It is a place so dear to them so utterly connected to them and they to it, that they want to be raised there, live there, and die there. I’m basing this speculation on the Biblical notion that “dust thou art, and unto dust shalt thou return” (Genesis 3:19) (something I imagine the Anglo-Saxons were aware of); the earth or ground isn’t just our home or where we make our dwelling, but we are the very stuff of it and return to it when we die. I think this extra shade of “eardlufan” deepens its meaning because it suggests a connection with a country and a land so strong that a person would give all they have for it. I might even go so far as to say that a person who uses such a word implies that they themselves are a part of the country or land from which they come. What’s more, to the Anglo-Saxons, a people who identified with the wandering, country-less Jews of Exodus, this notion of an incredible bond with a place must have been a great fantasy. It may have even driven them to settle in as much as they did in the British Isles. Perhaps it even encouraged them to establish a country for themselves, the nation of wanderers that they saw themselves as. But that’s just some succinct speculation. Though it brings to mind a question. When it comes to early nationhood, which do you think came first: a country big enough to sustain a large group of people or a large group of people who strongly identified as a single group? Next week, Grendel begins his approach to Heorot. Interlaced men motif. Image from http://public.wsu.edu/~hanly/oe/503.html. It’s party time in Heorot until Hrothgar, noticing the imminent falling of darkness, decides it’s time to call it a night. As had been the case the last time we were treated to quite a bit of expositional poetry from the poet/scribe himself, this week’s passage is rich primarily in words. And in one significant detail on which he dwells. Near the end of this weeks’ passage we’re treated to three and a half lines about the transition from day to night and the shifting from light to darkness. I think it goes without saying that there’s something of importance here. Or at least there could be. Why is this sort of sleep pattern the pre-industrial usual? I can’t rightly say. What significance does it have here? Well, maybe not much, but it’s a fun tidbit to trot out every now and then. Some of those words suggest “plan,” some don’t. But just about all of them suggest collaboration rather than singular action. I can’t help but get the impression that, aside from alliterative purposes (geþinged alliterates with þæm from earlier in the line), the poet put this word here to suggest one of two things about Hrothgar’s perception of Grendel. It could suggest that Hrothgar regards Grendel as a shrewd and potent planner. He sees Grendel as a being that lays out careful plans and then follows through, as if working by committee or with the force of will of several beings. Or, it suggests that Hrothgar is aware of Grendel’s collaboration with some other being. This doesn’t necessarily need to be Grendel’s mother. It could just as easily be a sense of some sort of spiritual communication amongst the other kin of Cain. Maybe those shunned by god just like to co-ordinate things really well. Looking further at Hrothgar’s departure from the hall, I wonder why he leaves at all. Is it that he’s running away? Clearing the way for this Geat who’s so eager to gain glory? Perhaps there was some kind of tradition that involved everyone belonging to a troop or band or peoples would just walk out once their leader did the same. If that’s the case, then Hrothgar could be trying to protect the Danes in this way. Though whether that’s from Grendel or from the menace of Beowulf and his seductive confidence, who can say? This week’s passage bucks the pattern that the last few have kept: it’s actually got some compound words! There is, however, one that I noted in the entry “Beowulf gets into puns and two regular words aren’t so regular (ll.590-597).” Well, the first half of it, anyway. This is “sige-folc.” I don’t really have anything new to say about it, except that in this context it is likely meant sincerely. After all, it isn’t necessarily calling the Danes a “victorious people,” just comparing the noise that they rose to the sort of noise that a victorious people would raise. The obvious connection is that the poet is saying that they’re celebrating before their problem has been solved. Though, at this point, I get the impression that the original audience probably already figured out that Beowulf was going to win. But maybe there’s more dramatic tension here than I realize. I mean, we haven’t really seen much of Grendel in action. We’ve heard the aftermath of his attacks described, but we’ve never really seen him in action. The opposite is also true. We’ve never seen Beowulf do anything. He’s boasted plenty, but done little aside from wearing his armour with a lordly air. So what’s the conclusion here? I don’t think the poet is trying for much beyond the surface reading of sige-folc. There’s a subtle reminder that the Danes are pre-empting their victory with a celebration here. Maybe there was an Anglo-Saxon sense of karma or cosmic irony and so this reminder could work as foreshadowing for Grendel’s mother’s attack after Beowulf has defeated Grendel. Though, I really can’t say what the poem’s earliest audiences thought and anticipated. “Word” can also refer to “rod,” “(possibly) gooseberry bush” or “the word incarnate.” Why that last trio of meanings includes “rod” and possibly “gooseberry bush,” I can’t really say. Anyway, the thing that makes this combination of words interesting to me is that it could be a reference to armies being stereotyped as talking about manly, powerful things. The literal translation of the compound is “power words,” and so I suppose it’s aptly applied to a bunch of warriors excitedly talking and drinking. It’s as if their confidence were returning to the Danes. For, even if a boast is empty, a boast is still something spoken from a place of confidence – even if that confidence is just an act. So the compound’s literal meaning is something like “cover of darkness.” Though that’s a bit plain. I think that something like “shade covering” or “shade mail” is a better fit — something that suggests that Grendel comes clothed in the darkness, not just under it. I prefer that sort of interpretation because it suggests that he was civilized, but not in the civil ways of man — no — rather in the ways that kin of Cain understand civility. Now, since elm and arbour are involved, what’s Robert Graves got to say? On page 190 of that book, graves simply says that the elm became the alma mater (pun intended, I think) of the wine god because it was used to support grape vines. Other than that, there’s not much. So, it’s a supportive tree, and so that may well be why it’s connected to the word “helm” and all of its implications of protection. Next week, check back to read about how Hrothgar hands things over to Beowulf on his way out. Are they in or out? Wulfgar runs to Beowulf and the Geats, bearing word of their being accepted by Hrothgar. This scene reminds me of Dorothy’s arrival at the Emerald City in The Wizard of Oz. I can very vividly picture Wulfgar popping his head out of a window cut into Heorot’s door and calling down to Beowulf that he and his Geats are allowed in. The trouble with that is that they’ve already taken seats at benches. So are those benches outside on Heorot’s lawn (perhaps the setting for a now lost epic poem about lawn bowling) or are they in some sort of antechamber? We are told, when the Geats arrive, that they lean some of their gear up against a wall (“sea-weary they set their shields aside,/battle-hard bucklers, against that hall’s wall;” (“setton sæmeþe side scyldas,/rondas regnhearde, wið þæs recedes weal,” (ll.325-326))). The benches (the exact word used is “bence” (l.327)) that they sit on are also vague. In the former case it seems as though they’re outside and have set their weapons up against the hall’s outer wall. The non-descript benches could also be outside (the word used isn’t “medu-benc” (“bench in a meadhall”) after all). But then what can be taken from Wulfgar’s mentioning the conditions of their meeting with Hrothgar; namely that they are to leave their shields and spears outside? Doing so could be an act of trust. It might be a way for the Danes to tell if the Geats are with honour and honesty. If they’re willing to leave the tools of their trade in the open, it shows that they see the Danes as no threat to their gear and that they believe that their equipment will be well kept for them. If the Geats are still outside it definitely explains why the poet/scribe hasn’t said more about the Danes’ reaction to them. They are still new arrivals in this land and do not yet have the ability to freely enter and exit it. In effect, they need to leave part of themselves outside in order to gain access. Though that does leave them with their swords. But, as poetic as this all is, I can’ help but thiwael-sceaftasnk that the Geats are free to bring in their swords because these items are more status symbol than weapon. Claiming to be someone’s son could only go so far, carrying your father’s sword would confirm your lineage. Along with whatever family resemblance there might be of course. Not to mention, swords seem to have a much richer life as the weapon for single combats and particularly tough spots in battles. The compound for “spear” that appears on line 398 suggests that that weapon is much more regarded as the brutal tool of human destruction. The word “wælsceaftas” literally translates as “slaughter/carnage spear,” leaving little doubt as to their efficacy in mass combat. Unless, behind all of this praise of spears, is a particularly boastful poet/scribe who thinks that the Danes and Geats were terrible swordsmen. English has never been a tonal language. The difference between Old English and even Middle English (what Chaucer and Gower wrote in) is wide since the former is a synthetic language and the latter is much more of an analytic language, but even so. English has always been English. Though, curiously, Old English seems to have more context-sensitive words. Seamus Heaney translated this as “my lord” and Francis Gummere translated the word simply as “to you” (l.391). From the original it’s clear that Wulfgar is addressing Beowulf directly. But even if he is a stranger, it seems as though more formality should be applied than that contained in “eow.” A nice “ðu” (modernized as “thou”) would be better suited. Unless Wulfgar, in conveying Hrothgar’s message of extreme welcome, is dialling it back a bit because he’s wary of this fierce band claiming to be from Geatland. As Hrothgar’s herald Wulfgar has no doubt seen his share of warriors coming to them with hopes of ridding Heorot of Grendel only to have those hopes plucked from them like legs from a spider. And maybe Wulfgar’s sick of seeing the flower of youth trampled in this way. All of the men of courage are throwing themselves at a problem with no clear solution and leaving the world filled with layabout rogues. Next week Beowulf and a select few of the Geats crowd into Hrothgar’s hall. Wulfgar brings Beowulf’s petition to Hrothgar. His tone makes a positive reply seem like a long shot. with the Danish lord: knew he their noble customs. Is this speech a sign of Wulfgar’s knowledge of the Dane’s “duguðe þeaw,” (“noble customs” (l.359)) or is it an honest plea to a forlorn lord? The honorifics (“my lord” (“þeoden min” (l.365)), “gracious Hrothgar” (“glædman Hroðgar” (l.367))) seem like things said as parts of Wulfgar’s addressing Hrothgar. They sound like what’s required of someone lower speaking to the highest ranking individual in the Dane’s hierarchy. But, it’s hard to read Wulfgar’s imploring Hrothgar to “not propose to deny/your reply” (“No ðu him wearne geteoh/ðinra gegncwida” (ll.366-67)) without hearing an imploring note. There’s something in those words that speaks to the Dane’s desperation. Perhaps Hrothgar has fallen into a depression after seeing so many warriors fall to Grendel’s might. Or, as Neil Gaiman would have it, Hrothgar is covering up some past misdeed of his with sorrow. I believe that Hrothgar has fallen victim to depression. Sitting amongst his warriors he’s no doubt reminded of how he valiantly fought to bring peace to his lands. And, being surrounded by those who are enjoying themselves in Heorot, he is no doubt reminded of the efforts that went into the construction of that glittering mead hall. And yet, empty seats all around him bring phantoms into his vision, ghosts of the past that hang off of his memory like overripe apples heavy with both savour and with worms. Anyone in that state of mind is likely to wave away petitioners and those willing to help without a further thought. Hrothgar seems to have no reason to look out from the past, he has nothing to look forward too, after all. Anyone in that sort of state would need someone like Wulfgar to talk them back to the present. Someone to inspire some hope in them, as Wulfgar attempts to. And, as we’ll see next week, there are hints that Wulfgar’s mentioning Beowulf’s name and his merit in bringing his fellow Geats so far that the attempt is successful. Hrothgar brightens – but stays well within the bounds of the customs of the nobility. As high and noble as the customs of a ruling host may be, they bear a striking resemblance to the customs of modern day politicians. Both are full of seemingly empty words. At least for our scholarly purposes, there aren’t many words of great interest in Wulfgar’s speech. Even the words used for “noble customs” (l.359), “duguðe þeaw,” isn’t necessarily all that interesting. The first word in the pair means “body of noble retainers, people, host, the heavenly host, strength,” and the second means “usage, custom, morals, morality.” So, like most other systems of conduct, there’s a suggestion of the Danes’ system having a higher origin (translating the phrase as “the custom of the heavenly host”). There’s also, perhaps reflecting poorly on Beowulf‘s time to our modern eyes, the translation “the custom of strength,” that could be construed as “might makes right.” Curious how heaven and power have that sort of relation – however distant. More interesting in an archaic sort of way, part of the word “getawum” (“war-gear” (l.368)) once had a different meaning. This sense of “taw-u,” the root of “getawum,” once meant “genitalia” (along with “apparatus, and “implement”). But, even to Beowulf‘s early audiences, I’m willing to guess whatever sense of “genitalia” was inherent in “getawum” was a distant echo, something that only the scholarly among them would catch. Next week we hear Hrothgar’s whispered reply to Wulfgar, and perhaps see the first stirrings of hope in this downcast ruler of a people. Is there a mic in that helmet? Beowulf replies to Wulfgar with his origins, but masks his purpose with formality. table-companions; Beowulf is my name. Despite the brevity of this passage, there are some things that can be said about it. Not the least of which is the continuation of a pattern we’ve seen before. In 6 February’s entry (in which Beowulf introduces himself to the coastguard, ll258-269), we saw that Beowulf didn’t just say outright “I am Beowulf.” Instead he introduced his group as friends of Hygelac’s, and then introduced himself primarily through his father. Once again, Beowulf introduces the group first, with a similar line explaining their relationship with Hygelac (l.342). But then, instead of introducing his father and merely claiming to be his son, we hear Beowulf say for the first time in the poem that takes his name, “Beowulf is my name” (“Beowulf is min nama” (l.343)). Surely the herald of a great prince like Hrothgar commands more respect than a coastguard? So then why does Beowulf simply give his own name (a name which makes no reference to his father)? My theory is that this has to do with the intimacy of the hall setting. Although this conversation is still very formalized, Heorot is nonetheless a place of leisure. It’s where Hrothgar and his thanes hang out and trade treasures and stories between battles and forays. The hall would even draw strangers into Hrothgar’s hospitality, at least, were it not for Grendel. As such, Beowulf has no need to show his “son of” card just yet. Even so, the other curious thing about Beowulf’s shift in tone is that he keeps his purpose for from Hrothgar’s herald. Instead of declaiming for all to hear, “I am Beowulf! I’m here to kill your monster” (as a cg’d Ray Winstone did), he says that he’ll reveal just what his purpose is when he speaks to Hrothgar. I think this feint is meant to show Beowulf’s social acumen. In a hall besieged for twelve years by some seemingly invincible terror, anyone (especially anyone as young as Beowulf’s supposed to be here) coming around claiming to be there to deal with Grendel is likely not going to be believed. Likely, for most of those twelve years such an approach hasn’t been useful. Those who did come in with boasts blaring were probably laughed out of the hall. And once you’ve been laughed out of something it’s all the harder to win glory there. All the more so if you appear ridiculous. It might seem Beowulf would were he still wearing his helmet, as the poet suggests on line 342. But this detail appears to bolster his position. Maybe it’s all just to keep building up the mystery around these Geats among the Danes. The Geats’ helmets are supposed to have cheek-guards, and you’d think that they would protect the helmet’s wearer from sight as well as blows. Or perhaps the poet is engaging in a bit of embellishment. Painting Beowulf into a bit of a caricature of a warrior. He keeps his helmet on so that he can be ever vigilant. Or maybe because it’s simply the outfit of a warrior and keeping his helmet on shows Beowulf’s seriousness. Regardless, I definitely think it’s a poetic detail. Though his speaking “bold[ly] beneath his helm” could well be an image of sorts, suggesting that Beowulf spoke as deeply as if he were wearing a helmet. Maybe there’s even something about Beowulf’s tone itself being a source of protection in such an image. Next week, Wulfgar takes Beowulf’s message and departs.